Washington, D.C. – Today, Commerce Secretary Wilbur Ross announced that the Trump administration will follow through with its imposition of steel and aluminum tariffs on the European Union (EU). 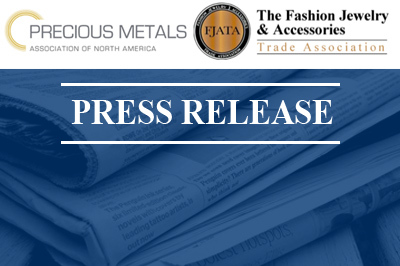 The Precious Metals Association of North America (PMANA) and Fashion Jewelry and Accessories Trade Association (FJATA) are particularly concerned with the effect this decision will have on precious metals jewelry exports to the EU. In response to the new tariffs, the EU immediately announced that it will increase duties on U.S. imports totaling $7.1 billion, including $1.5 billion in precious metals jewelry. Both organizations worry that the administration’s actions will further restrict the competitiveness of American jewelry in one of its most successful markets. “Due to undesirable conditions, including rules and regulations that promote foreign jewelry, U.S. manufacturers have found success competing in the European market,” said Scott Smith, president of the PMANA. “With the new EU duties on American jewelry, we will lose our market share to the same foreign competitors beating us on our turf,” Smith said. Brent Cleaveland, executive director of the FJATA, says both industries’ competitive edge is also affected by the importation of counterfeit goods – a problem that the U.S. could address with the help of key allies such as the EU. “We are seeing many brands losing their domestic market share to cheaper, dangerous counterfeits – imported mainly from China. With a critical ally in the EU, we would hope the administration would leverage this relationship, rather than jeopardize it, to put pressure on China,” Cleaveland said.